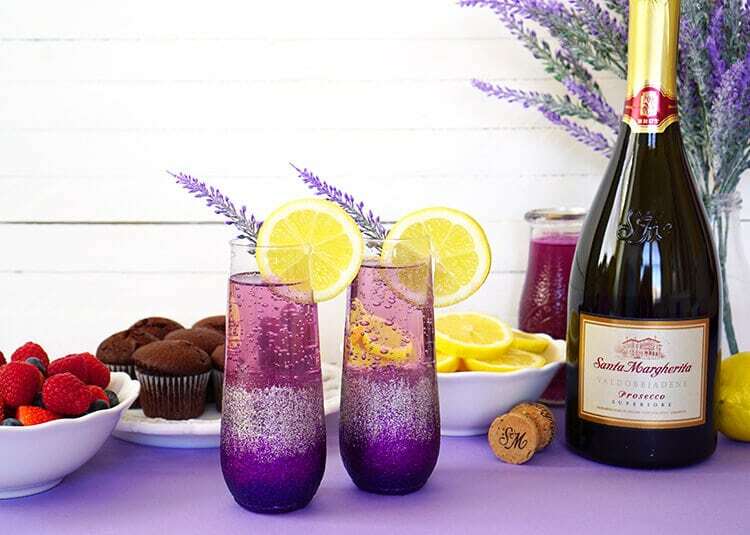 Lavender Lemonade Prosecco Cocktails + DIY Ombre Glitter Champagne Glasses are the perfect pair for a Sunday Brunch with your favorite girlfriends! 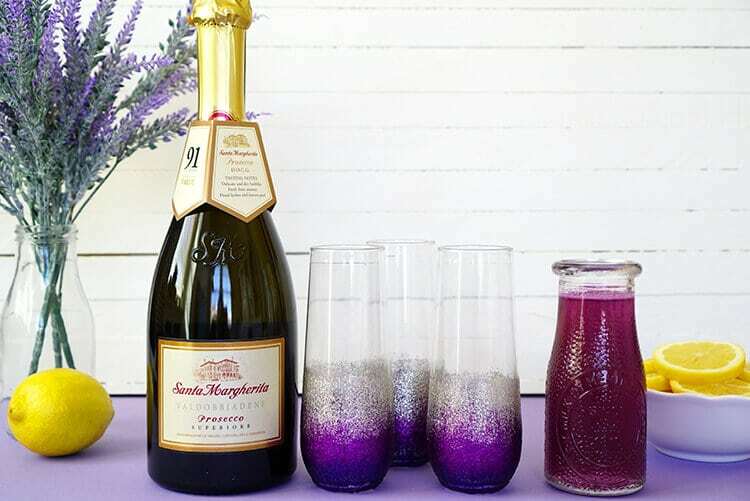 Get the Prosecco cocktail recipe and learn how to make these fun champagne glasses! Sunday Brunch is one of the greatest joys in my life (helloooo, quiches, muffins, and mimosas! ), and Sunday Brunch with my favorite girlfriends is one of the best things EVER! 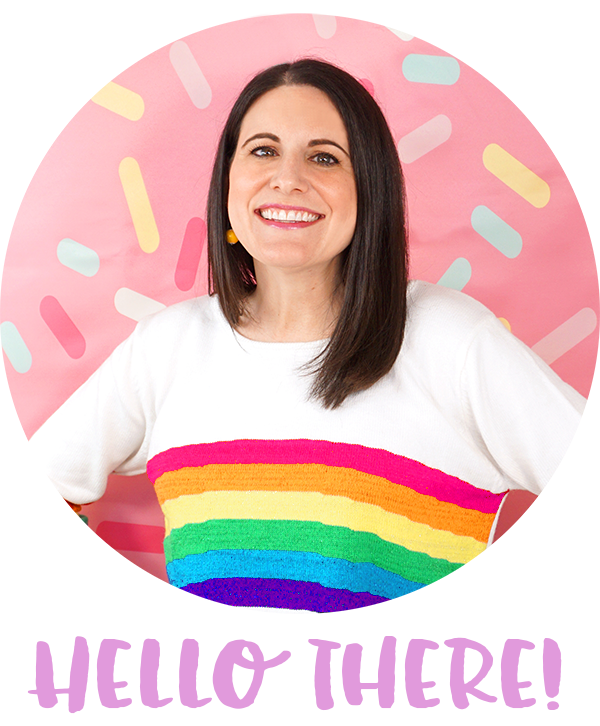 As busy moms and business owners, we don’t get the opportunity to spend as much time together as we would like, so we thoroughly enjoy and cherish every moment of each Sunday Brunch that we get to spend together. It’s a simple but memorable affair, and it always leaves each of us with a renewed spirit and grateful heart. 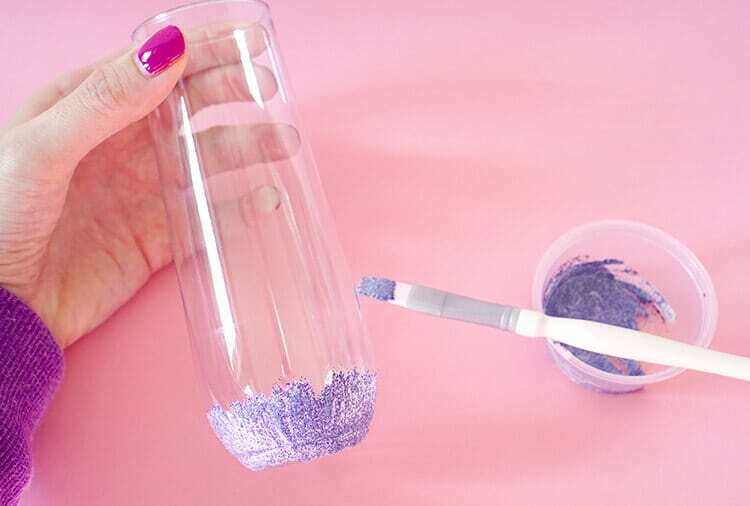 This time, I wanted to create something extra special and sparkly for our girls’ brunch, so I decided to give our champagne glasses a gradient ombre glitter makeover. 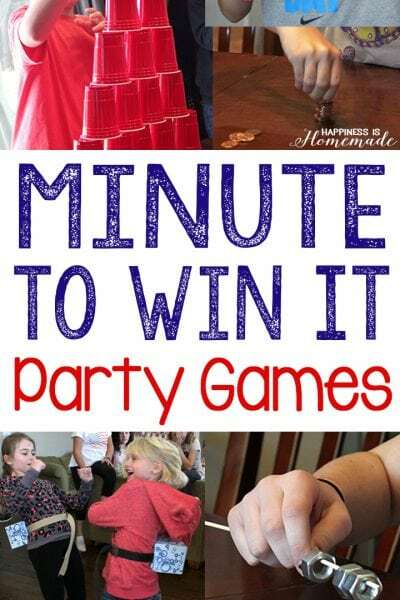 It may look fancy schmancy, but it’s actually a super quick and easy project that’s sure to impress your guests! 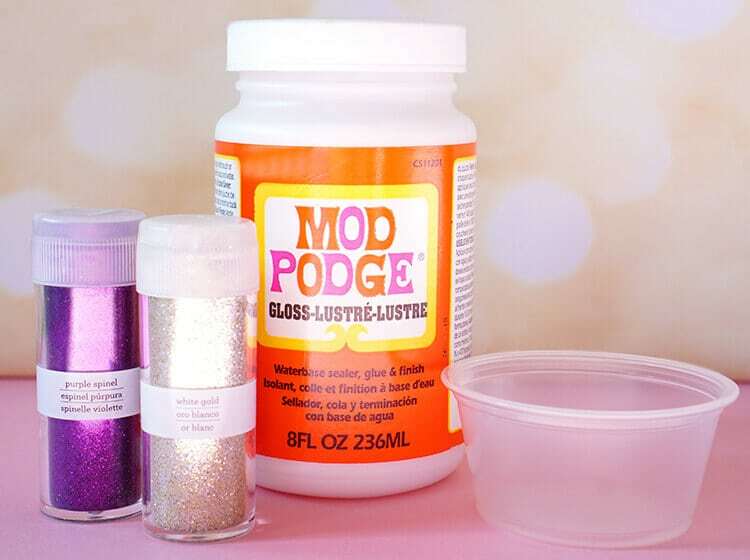 In a paint tray or small bowl, combine equal amounts of Mod Podge and glitter – start with the darkest color at the bottom. 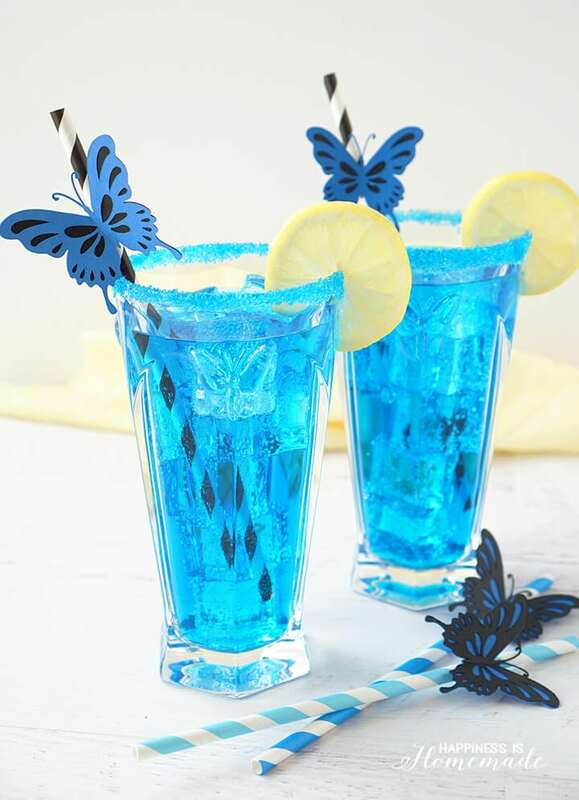 Use the paintbrush to paint the mixture onto the bottom of each glass using short upward strokes. Repeat the process for each of the colors, moving towards the top of the glass with each new color. 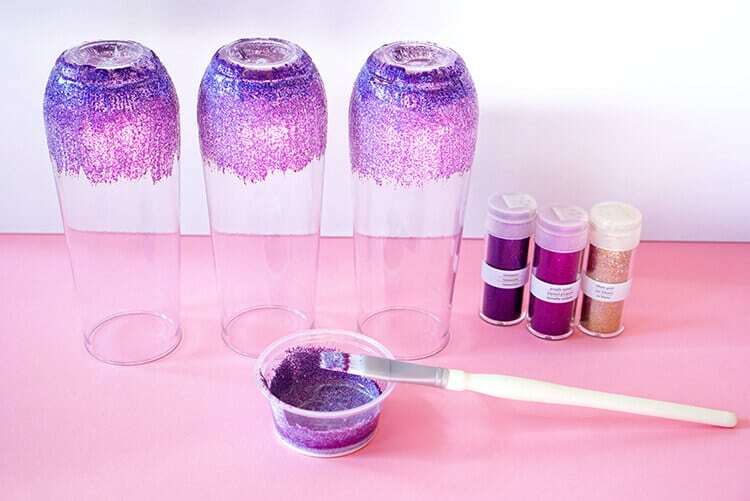 Overlap the glitter paint with the previous color to create the ombre effect. Allow the glasses to dry completely. So, what type of brunch cocktail is worthy of being served in these gorgeous new glasses? 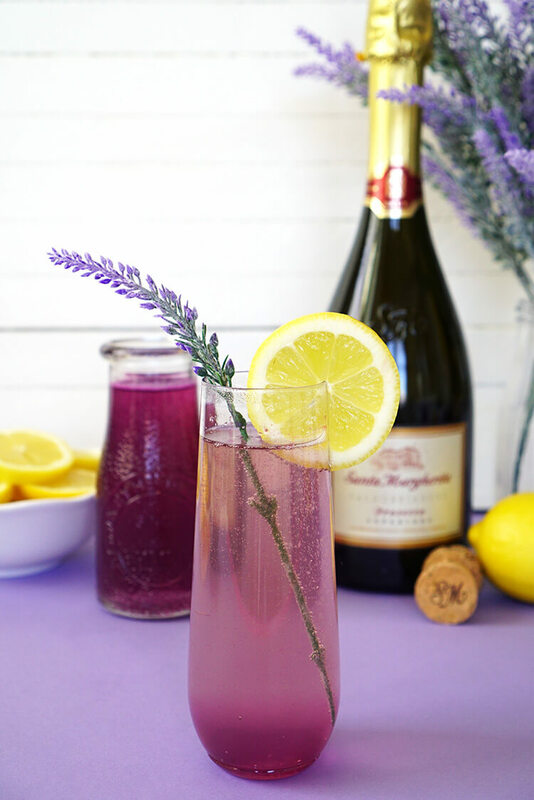 A lavender lemonade Prosecco cocktail, of course! 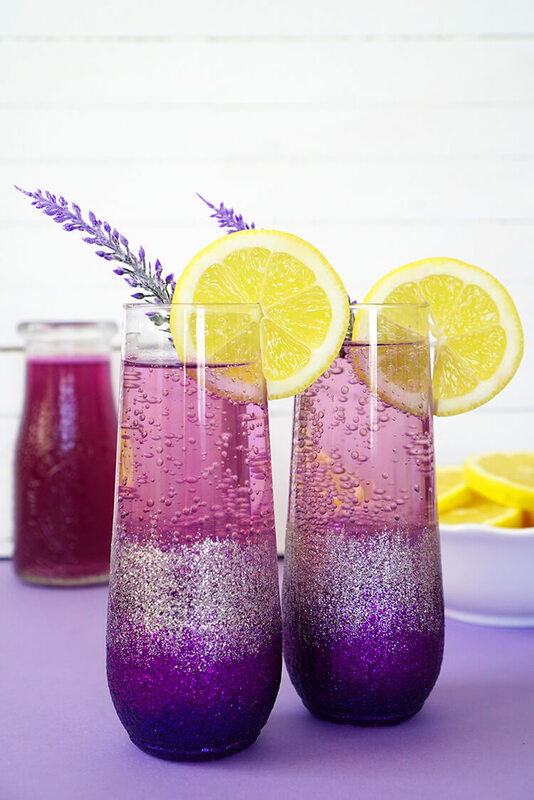 To make the lavender lemon syrup, combine 1 cup of sugar, 1/4 cup of lemon juice, 3/4 cup water, 1 tablespoon of dried lavender (can also substitute fresh lavender or 3 drops of food-grade lavender essential oil), and 2-3 drops of neon purple food coloring (if desired). 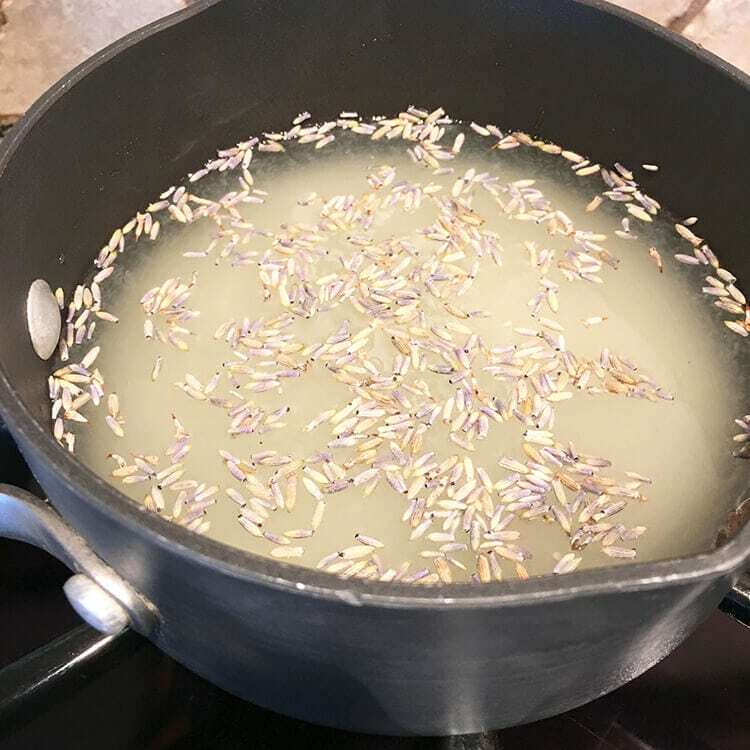 Simmer over low-medium heat for 15 minutes, allow to cool for 15 minutes, and pour through a fine mesh strainer to remove the lavender buds from the syrup. 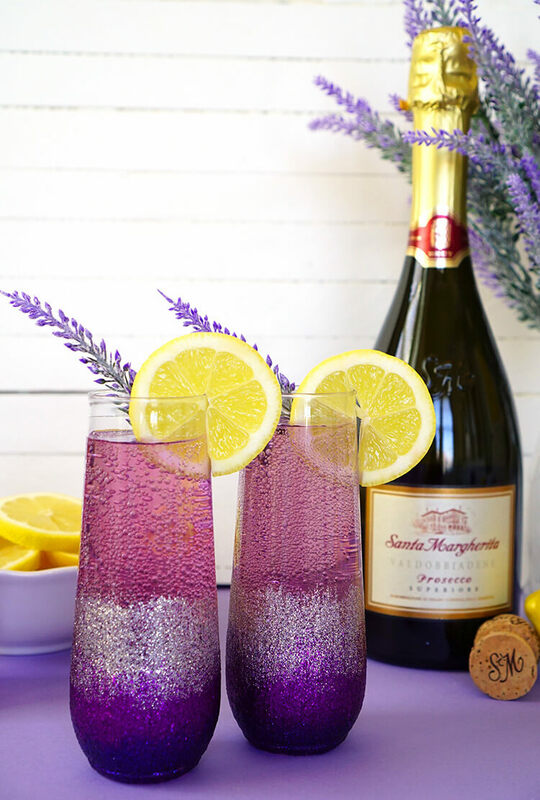 To mix the lavender lemonade Prosecco cocktail, fill the bottom of each glass with 2 oz. 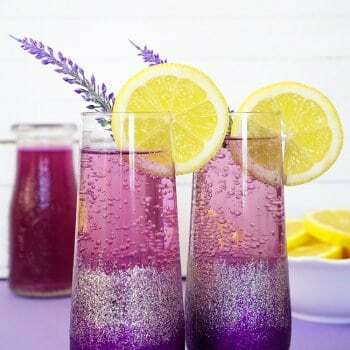 of lavender lemon syrup, and top it off with 6 oz. of Santa Margherita Prosecco DOCG. 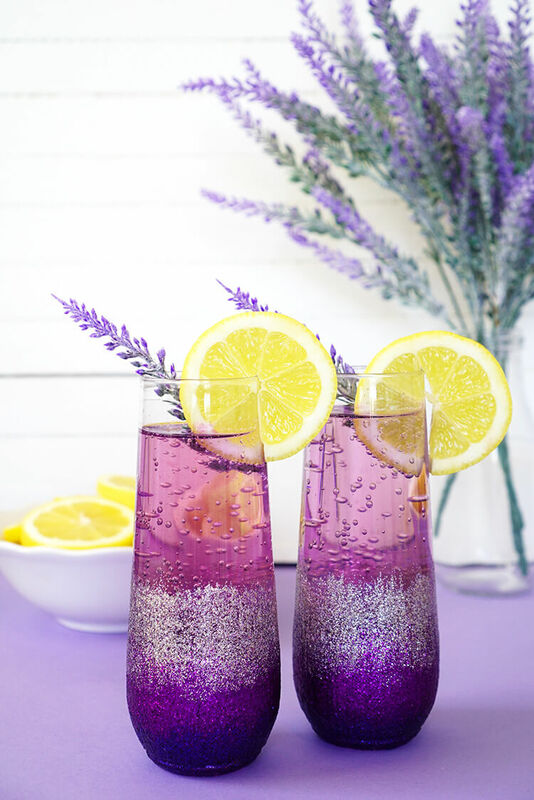 Garnish each cocktail with a lemon wheel and a sprig of lavender – SO pretty! See what I mean? 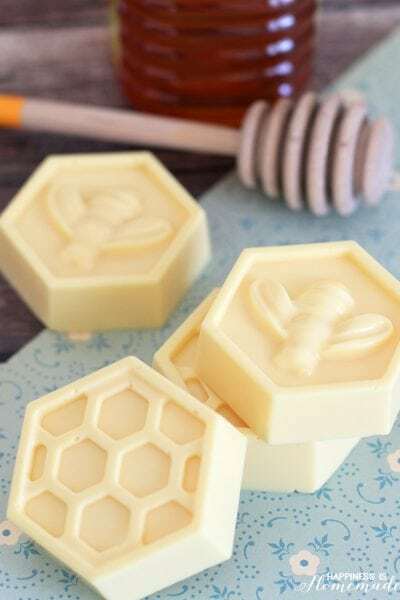 Totally gorgeous and perfect for a girls’ day! 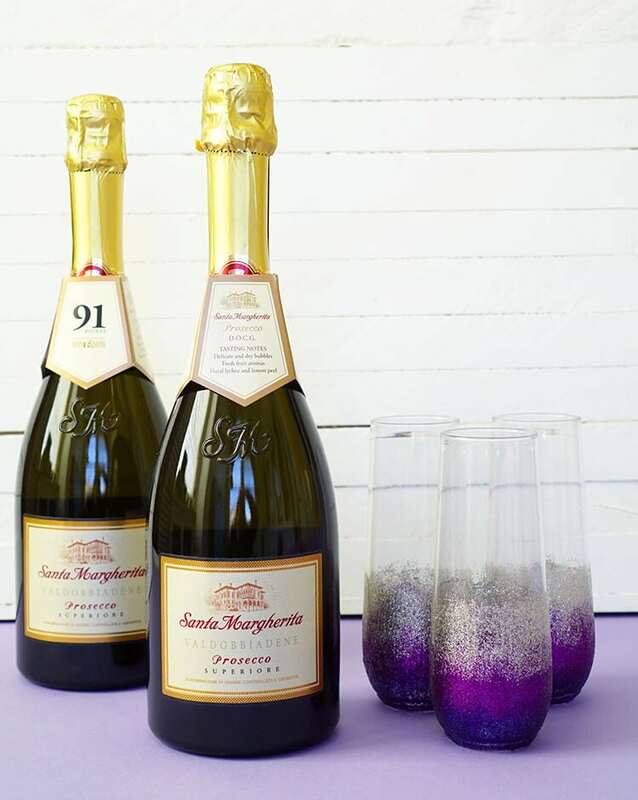 Glitter + Santa Margherita Prosecco DOCG + Sunday Brunch + my favorite girlfriends = the very best way to celebrate life! 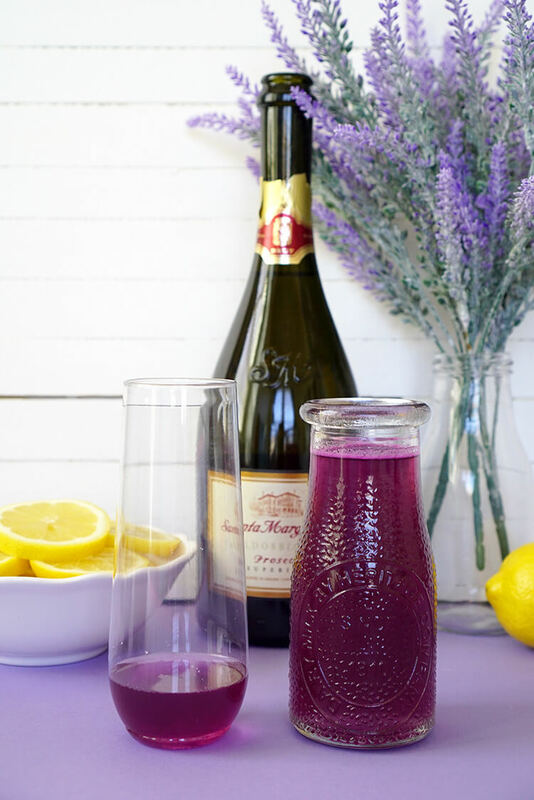 This lavender lemonade Prosecco cocktail is one of my favorite ways to celebrate the everyday moments, whether I’m sipping with the ladies while swapping stories and life lessons, or if I’m relaxing with my family on the weekend. 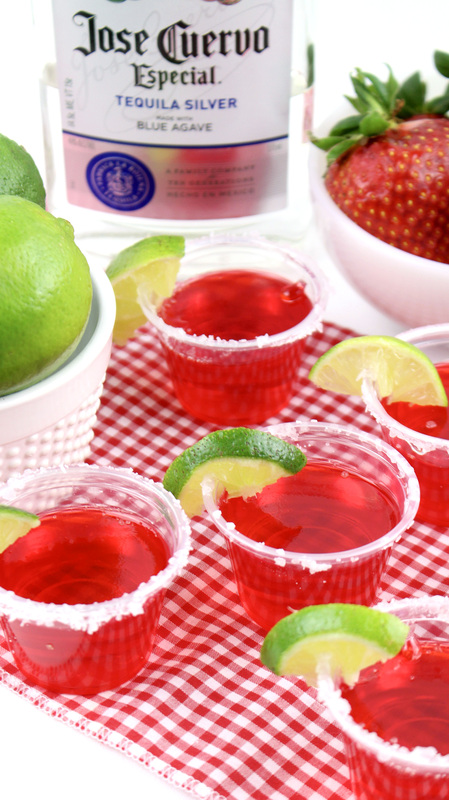 It’s an all-occasion superstar (thanks to a little help from Santa Margherita!)! In a small saucepan, combine sugar, lemon juice, water, dried lavender, and 2-3 drops of neon purple food coloring (if desired). Simmer over low-medium heat for 15 minutes, whisking frequently. Pour the mixture through a fine mesh strainer or cheesecloth to remove the lavender buds. * You may substitute dried lavender with fresh lavender or 3 drops of food-grade lavender essential oil if desired. 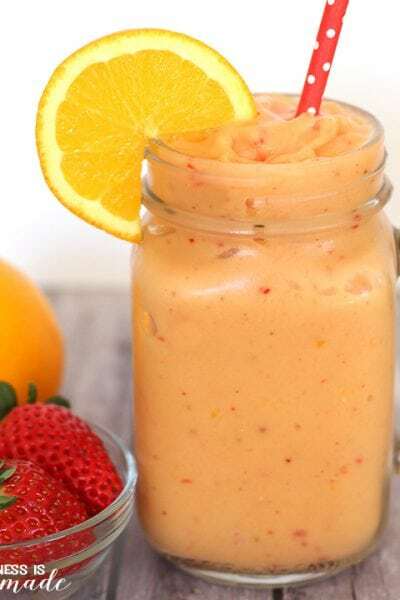 Is there a way to make this drink non-alcoholic for a Mother-Daughter Girl Scout Spa Day? I love the way it all looks together! 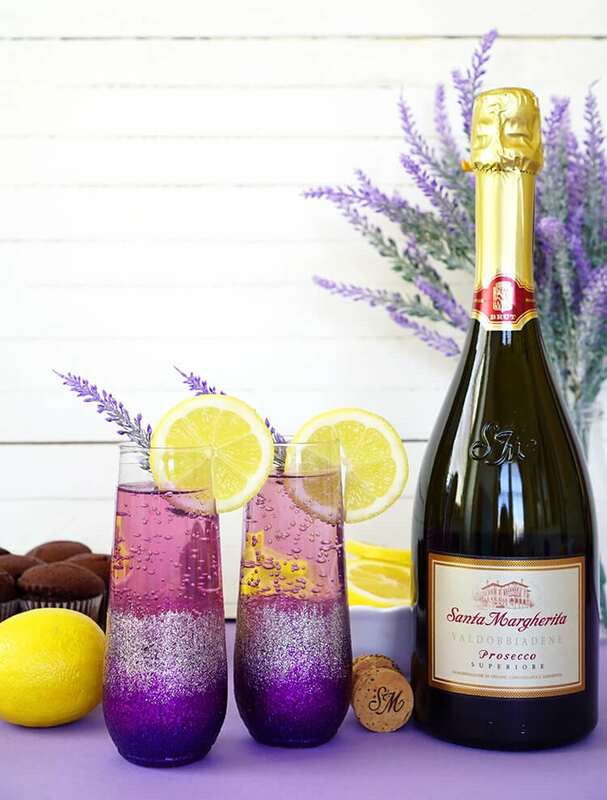 I’m thinking sparkling champagne, but not sure if the taste would be right? Absolutely! 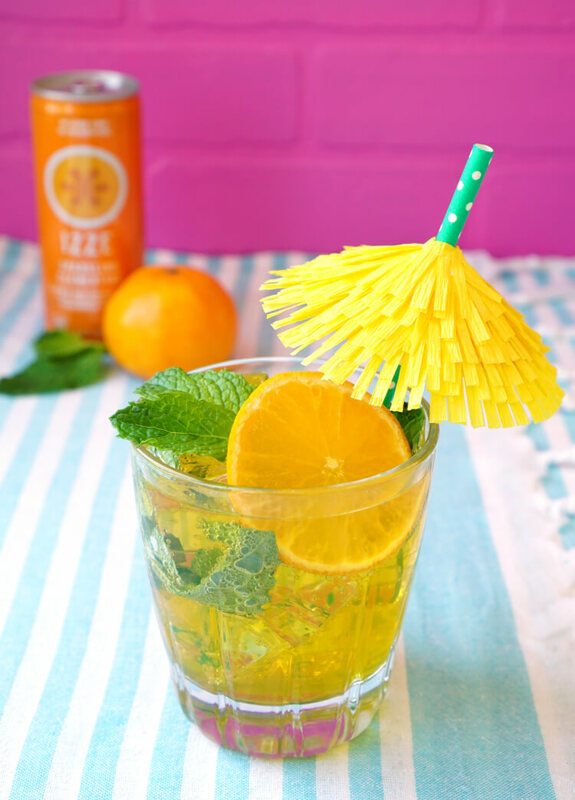 You can substitute lemon-lime soda for the prosecco (that’s what I do for my kids! 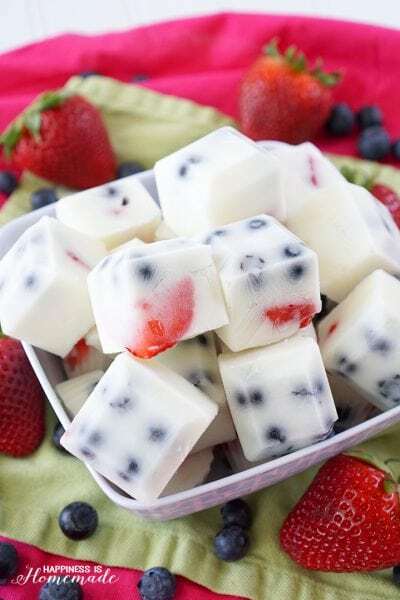 ), and it still tastes delicious! Can you put the glitter glasses in the dishwasher and the glitter stay in tack? Oh, my goodness, I love this whole post. Every picture is so pretty. 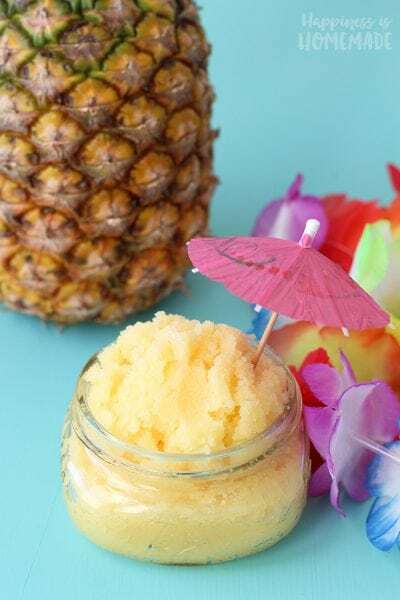 I have pinned this recipe and one of the activities on my summer bucket list is mastering the making of an adult beverage. This might be the one. Where would I find edible lavender essential oil? I would like to know if the glitter comes off on your hands. I think this is beautiful but I hate getting a card or using anything with glitter because of that. 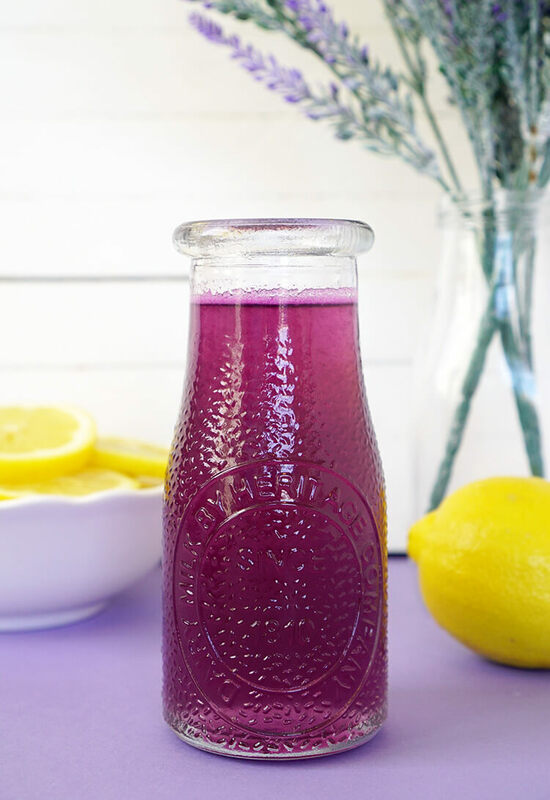 How long does the lavender syrup last in the fridge?